From delivering packages for Amazon to being mounted with a chainsaw (because why not), drones have been put to some creative uses as they become more popular and less expensive. One UBC researcher has been using them for a slightly more scholarly purpose — studying bowhead whales in the Canadian Arctic. PhD student Sarah Fortune has spent the last four summers in Cumberland Sound, Nunavut, collecting data to help predict how changing climate will impact the region’s bowhead whales. Bowheads are baleen whales that make their home in arctic waters from northern Canada to Alaska, and are one of the world’s longest-living mammals, having been documented as being as much as 211 years old. Fortune and her team have focused on studying the feeding habits of bowheads, determining the type and quantity of zooplankton they eat. Using this information in combination with models of how climate change will impact zooplankton, they will be able to predict how the bowheads might migrate in the future. Knowing where the whales are likely to go will be important for fisheries managers, especially as shipping traffic and oil and gas exploration increase with melting arctic ice, as well as for the Inuit groups that still practice subsistence hunting of bowheads. To identify what kind of organisms the whales were consuming, the team collected samples of zooplankton, analyzing where they could be found in the water column, then combining that information with data about the dive tracks of whales collected from satellite tracking tags. With that information in hand, Fortune and her team then needed to determine how much zooplankton the whales consumed, and for that they turned to a technique called photogrammetry. Photogrammetry uses measurements like width, length and shape taken from images of whales in order to determine things like age and body condition. From that information, energy requirements can then be calculated, telling the researchers how much zooplankton a bowhead needs to eat to stay healthy. This was where the drone, which Fortune and her team used for the first time this summer, came in. Beyond being downright beautiful, the images they collected provided much better data than could be gathered in the past. Traditionally, photogrammetry observations were taken from boats or small aircraft that would orbit above a whale or group of whales while researchers collected images. According to Fortune, however, those collection techniques have big limitations that the use of drones can address. One of the biggest is cost. Compared to renting a light aircraft, the cost of using a commercial drone service like that used by Fortune and her team is just a fraction of an aircraft. Another is the superior image quality and ease of observation allowed for by drones. While a plane has to do tight circles around a whale in order to collect images — a demanding maneuver for a pilot — drones make the process much easier. There were also some specific geographical features of Cumberland Sound that made drones the best choice for conducting research there, said Fortune. Being a fjord with high cliffs rising steeply out of the shallow waters where bowheads spend much of their time, it is a difficult and dangerous flying environment for a pilot. 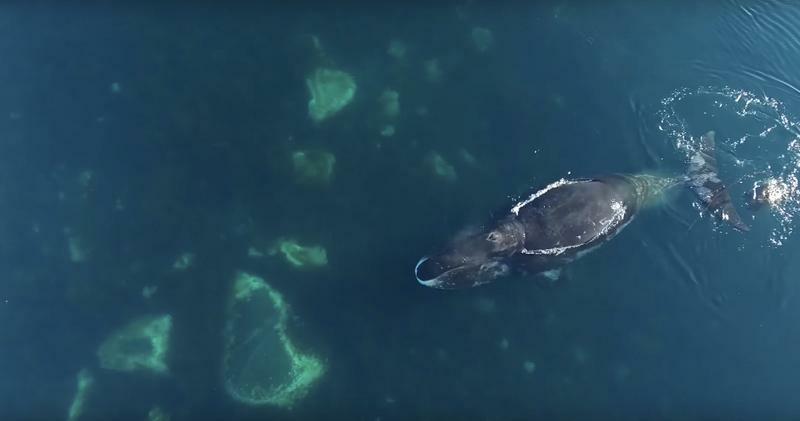 Using a drone eliminated any safety risks, and allowed the researchers to observe the whales in areas that, even by boat, were previously inaccessible because of their shallow depth. There are, however, some disadvantages to using drones, according to Fortune. Due to its limited battery life, the drone had to return to the research boat every eight to twelve minutes before being sent out again and the range of the drone was also limited to about a kilometre since the operator always had to maintain visual contact. Despite those limitations, however, Fortune sees a great deal of value in the use of drones for whale research — a practice that has been steadily gaining popularity in the marine biology community. Besides Fortune’s study, drones have also been used in photogrammetric studies of killer whales off the coast of Vancouver Island and blue whales off the coast of Chile. They are even being used as a way to non-invasively collect lung lining samples from the blow exhaled by whales when they surface. That’s right and it’s called the Snotbot. Going forward, Fortune hopes to put drones to use to conduct a much broader survey of the Cumberland Sound bowheads to gather more complete demographic data about the population. Drone technology continues to rapidly advance, and with studies like Fortune’s proving their value in marine mammal research, they are likely to become an increasingly important scientific tool in the years to come.